Primary campers are four to six years of age. Each week the children will be busy discovering a theme from nature such as earth, air, fire or water. 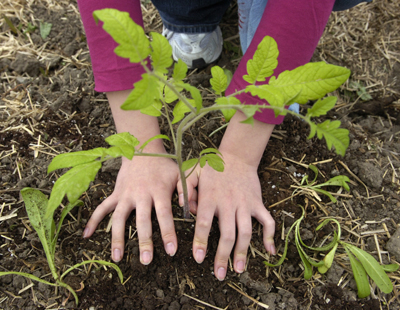 They may work with the soil in planting and growing and encouraging care of the earth. With the magic of air, things move and we cannot see what happens when air moves. Water flows from here to there but it does not always go there in a straight line; some things float some sink. Fire can be used to warm us or to cook our food. Whatever the theme, they will be happily discovering nature every day. The primary camp will model the gentle rhythm of our Kindergartens that so lovingly nourish each child’s developing coordination, cooperation and creativity. Each day will be a calm and joyful journey through imaginative play, circle games, songs and stories. We will spend a lot of our time outside in nature, on walks, or in the forest. with the colors we find. on a branch with me. Splashing up on the sand. sprinklers, sure to have your child make a splash. The garden is the perfect place to explore as a young child in summer. chance to dig, water, plant seeds and enjoy the fruits of summer. Blow the sun fairies around. And dance on the ground. feet with songs, whistling, circle games, and stories of gales and gusts. Gather round, and come listen to tales of what the land has seen before.